John Rainnie M.A. born Belhelvie 1841. Ed. Abdn Univ. & Abdn F.C.C. 1876. Married 1878 Isabella F. Edie. Alexander Cook Fullarton. Born Brodick, Arran, 1820. Glasgow Univ. Born Kirkaldy 1846. Studied at Galsgow University and English Presbyterian Hall. 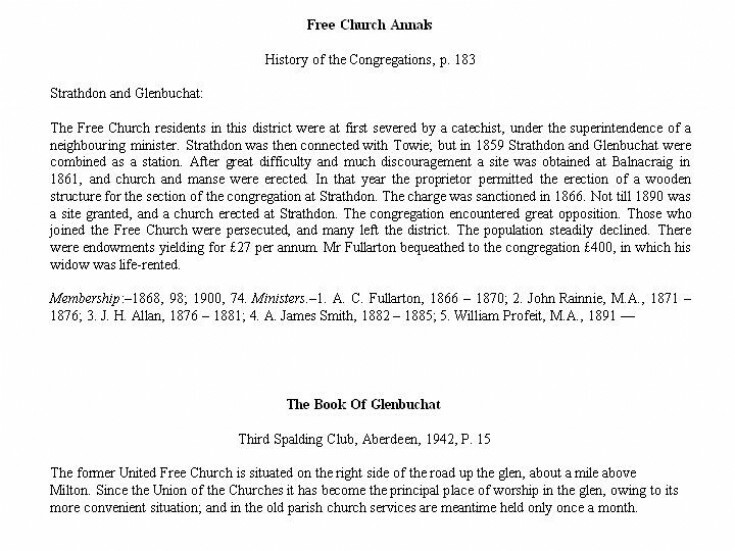 Ordained at Strathdon, 1876; translated, 1881, to North Yell. Married, 1876, Ellen Deans Smith. Died, 1899.